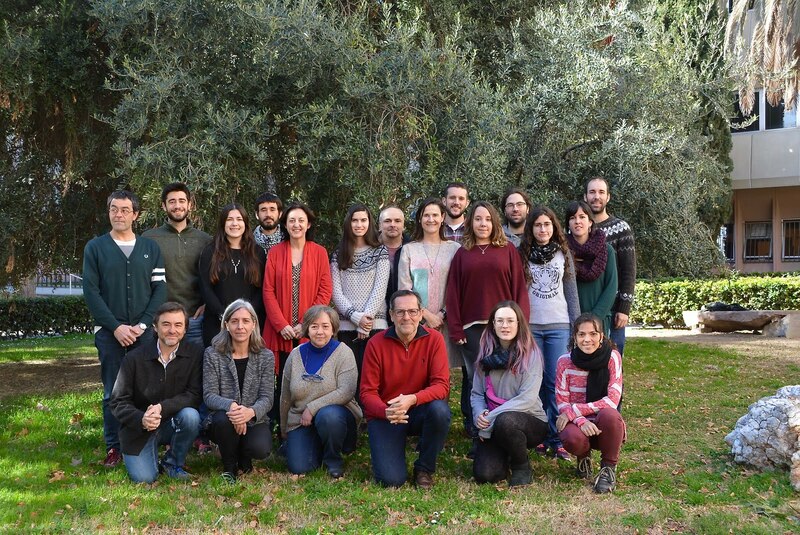 Nuestros aragosaureros Juan Rofes (UPV-EHU) y Gloria Cuenca Bescós (Universidad de Zaragoza) han colaborado en un artículo liderado por Pere Bover (IMEDEA-CSIC) que acaba de publicarse en la prestigiosa revista Integrative Zoology. A continuación, una breve reseña del trabajo. 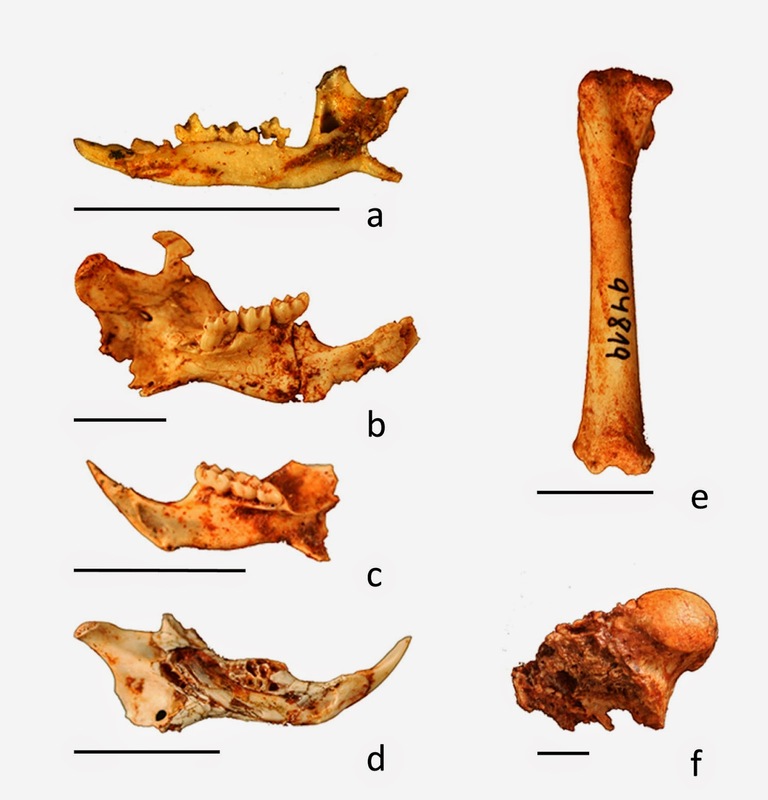 El registro fósil de vertebrados terrestres de la isla de Mallorca está dominado desde el Plioceno inicial hasta el Holoceno por tres líneas filogenéticas de mamíferos: el bóvido Myotragus, el glírido Hypnomys y el sorícido Nesiotites, los cuales estaban acompañados por el lacértido Podarcis y el discoglósido Alytes. El origen de esta fauna se estableció como un episodio de colonización durante la Crisis de Salinidad del Mesiniense (CSM), hace poco más de 5 millones de años. Hasta hace aproximadamente diez años se desconocía si estas líneas filogenéticas habían colonizado en solitario esta isla, o por el contrario, si formaban parte de un grupo más abundante de taxones que llegaron a Mallorca durante la CSM, con la posterior extinción de algunos de ellos. 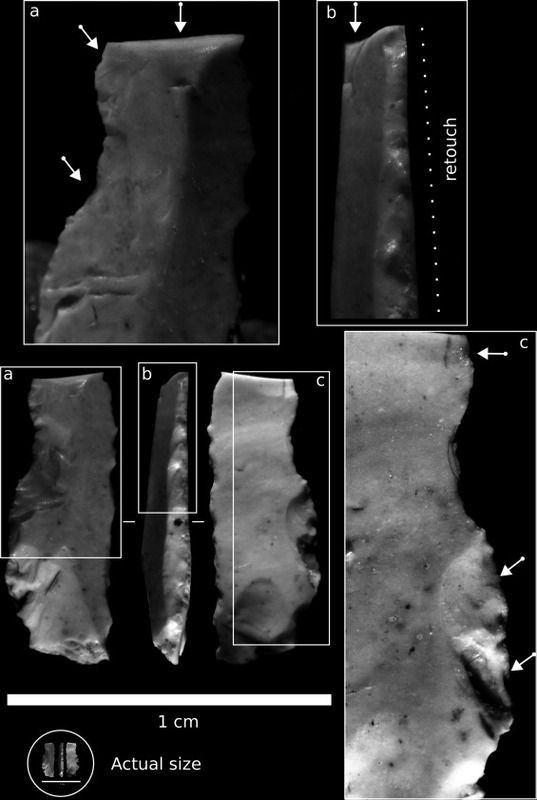 Exploraciones paleontológicas llevadas a cabo en Mallorca han permitido el descubrimiento de dos nuevos yacimientos de cronología Mioceno final/Plioceno inicial: Caló den Rafelino (CdR) y Na Burguesa-1 (NB-1). Hasta la fecha, 4 nuevos mamíferos y 2 nuevos reptiles han sido ya identificados en el yacimiento del CdR, mientras que la composición faunística del yacimiento de NB-1, descubierto en abril de 2012, está formada por, como mínimo, 6 mamíferos terrestres, 8 reptiles y un anfibio. Este último yacimiento destaca por su riqueza y está actualmente en estudio, por lo que la lista de taxones podría verse incrementada. Bover y colaboradores presentan un listado taxonómico preliminar de las especies halladas en el depósito de NB-1, juntamente con datos inéditos del yacimiento de CdR. Cabe destacar que estos depósitos y los restos que contienen están cambiando la visión que se tenía sobre las faunas que colonizaron la isla durante la CSM, momento en que, efectivamente, un mayor número de especies habrían colonizado la isla, y sólo 5 de estos taxones habrían sobrevivido hasta el Holoceno. La presencia de características primitivas en algunos componentes del yacimiento de NB-1 permite establecer que este depósito fosilífero podría tener una cronología ligeramente anterior a la del CdR, aunque la coincidencia de taxones en ambos yacimientos indica que se trataría prácticamente del mismo complejo faunístico. Las características morfológicas de algunos taxones en ambas localidades sugieren que estas faunas podrían encontrarse en un estado inicial de evolución en condiciones de insularidad. Sin lugar a duda, estos hallazgos permitirán entender y analizar diferentes aspectos tanto taxonómicos como paleobiogeográficos de las Islas Baleares. La referencia completa es: Bover, P., Rofes, J., Bailon, S., Agustí, Cuenca-Bescós, G., Torres, E., and Alcover, J.P. 2014. Late Miocene/Early Pliocene vertebrate fauna from Mallorca (Balearic Islands, Western Mediterranean): an update. Integrative Zoology 9: 183-196. Postdoctoral Fellowship, Evolution of Terrestrial Ecosystem (ETE) Program, Paleobiology Department, Smithsonian Institution, National Museum of Natural History, Washington, D.C. Applications are invited for a two-year Postdoctoral Fellowship in ecological community assembly and disassembly through time. This appointment provides a stipend of $45 K/yr and may be renewable for a second 2 years. The successful applicant will be expected to conduct independent macroecological research as part of an NSF-funded Research Coordination Network, “Synthesizing Deep Time and Recent Community Ecology,” which is investigating patterns and causal processes of animal and plant community assembly and disassembly over geological time and up to the present day. Duties will involve data management and analyses and involvement in the scholarly activities of ETE, including workshops, presentations at professional meetings, etc. In addition, the awardee will be encourage to lead one or more group projects that align with their interests. The ETE-RCN Fellow will be co-advised by Kate Lyons (www.mnh.si.edu/ete/ETE_People_Lyons.html), Kay Behrensmeyer (www.mnh.si.edu/ete/ETE_People_Behrensmeyer.html) and Nick Gotelli (www.uvm.edu/~ngotelli/homepage.html). The position will be based at the NMNH in Washington DC. Priority will be given to applicants who use recent and/or fossil data to understand factors affecting community structure in plants and/or animals. Applicants should have good communication skills, a proven record of research accomplishment, and knowledge of ecology, paleoecology, macroecology, or a related field. Fluency in R programming, expertise in modeling and spatial and temporal analyses, and a record of working with large databases are highly desirable. Knowledge of SQL is a plus. Applicants must have a PhD before starting the fellowship. To apply, send as a single pdf including: (1) cover letter describing your interest in this post-doctoral position, relevant experience including R coding examples, and preferred start date; 2) a brief statement of research interests (3) curriculum vitae; (4) a pdf of publication or other outlet where R code was used. In addition, please arrange to have two letters of reference sent to Dr. Kate Lyons (lyonss2@si.edu). Application materials should be received by 15 May 2014, addressed to: lyonss2@si.edu. Universidad de los Andes, Colombia, seeks applications for three tenure‐track faculty positions in the Department of Geosciences. Universidad de los Andes is located in central Bogotá, Colombia, and is the second highest rated University in Latin America by Times Higher Education, with a student body of 13500 undergraduates and 3000 postgraduates. The Geosciences Department currently consists of six full time research and teaching faculty. Applications from all fields of the geosciences are invited, including but not limited to: geophysics, (bio)geochemistry, hydrogeology and oceanography, atmospheric/climate science, geomorphology, igneous geology/volcanology, stratigraphy/paleontology, to complement existing strengths in the Department, and to support the newly-formed Master’s program in Petroleum Engineering. Applicants are required to have a Ph.D., ideally with two years postdoctoral experience and a demonstrated capability to lead a scientific research program, or extensive and relevant industrial experience. All candidates must have a record of significant and innovative research, documented by peer-reviewed publications. Candidates will be expected to develop and maintain a vigorous, externally funded research program; teach courses at the undergraduate and graduate levels in English or Spanish; supervise undergraduate, masters, and doctoral student research; contribute to departmental and University administration; and support outreach activities. It is anticipated appointments will be made at the Assistant Professor level, with higher level appointments considered on an individual basis for highly-qualified applicants. Applicants should submit cover letter, curriculum vitae, clearly defined research proposal, teaching statement, and contact information for three referees as a PDF document to: director-geociencias@uniandes.edu.co Questions related to the positions should be directed to the Chair of the Geosciences Search Committee, Program Director Dr Ferney Rodriguez (frodrigu@uniandes.edu.co). Review of applications will begin on April 30, 2014 and will continue until the positions are filled. Starting dates is preferably August, 2014. The Paleontological Society is pleased to announce the Arthur James Boucot Research Grants to support early career paleontologists in the fields of morphology, taxonomy, and biostratigraphy, working on any taxa. Arthur James Boucot Research Grants support original research via payments to postdoctoral students, assistant professors (pre-tenure), and other early career paleontologists, with the possible exception of an occasional individual deemed to be unusually qualified. Paleontologists must be associated with universities, institutes, and academies of science or equivalent institutions. Applications are encouraged from the United States and elsewhere in the world. Applicants must be Paleontological Society members unless they can demonstrate why membership is unfeasible for them. For 2014, the Paleontological Society has up to $10,000 to award. The amount and number of the awards may vary depending on the quality of the proposals. Therefore, budgets can be written for up to $10,000, but smaller and concise budgets are recommended. The award will be made directly to individuals and not to institutions. The award cannot be used for institutional overhead, publication costs, or modeling studies that rely upon fossil or modern databases. Grantees will be selected by a committee of the Paleontological Society based on the quality and feasibility of the proposed research. The PS-AJBoucot grants are named in honor of Dr. Arthur James Boucot, a vigorous field geologist/paleontologist and former President of the Paleontological Society (1980-1981). Art is an awardee of the R.C. Moore Medal (SEPM, 1985) and Paleontological Society Medal (1999). He has authored over 500 publications and books and is still going strong! His research has focused on evolution, paleoecology, biostratigraphy, paleobiogeography and solving geologic boundary disputes for the Ordovician, Silurian and Devonian systems using brachiopod and gastropod fossils.